This Thunderbolt™ 3 cable delivers lighting fast data transfer rates for storage, single-cable docking, external graphics for high speed gaming, and Thunderbolt networking between computers. 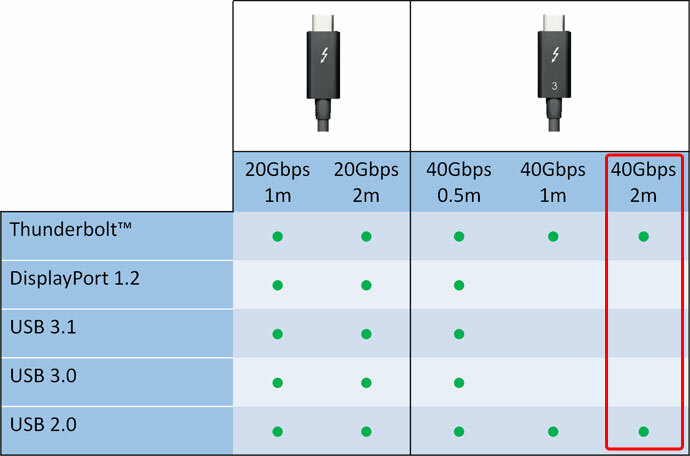 Based on Intel's Thunderbolt™ 3 technology, this Thunderbolt™ 3 cable with the USB Type-C™ connector enables 40 Gbps bi-directional data transmission and reversible connectivity. This cable is designed only for Thunderbolt™ 3 computers and Thunderbolt™ 3 devices. This cable can only be used with Thunderbolt 3 computers and devices. It is not compatible with USB 3.0/3.1 computers and USB 3.0/3.1 devices.